CommaVid was the sort of 3rd party developer that wanted to differentiate themselves in every way possible. From the elongated cartridges and unconventional game play, even their advertising was unique. 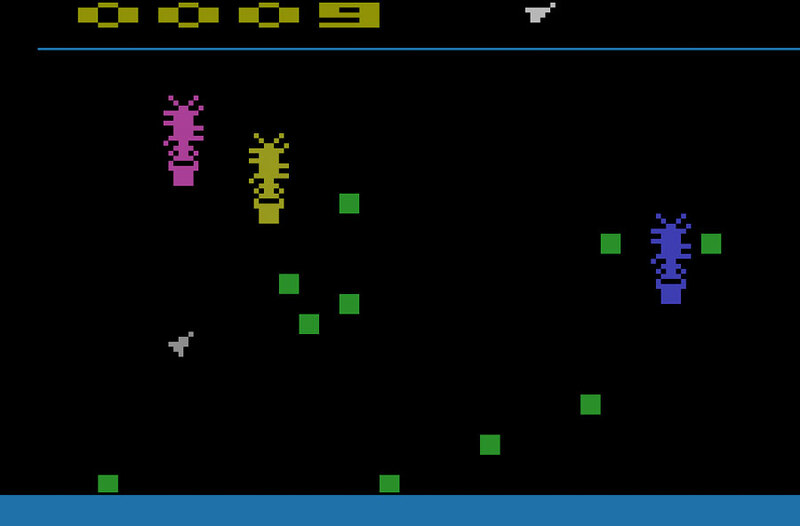 At the same time it's hard to look at Cosmic swarm and not see the similarities to Asteroids and Centipede. The shape and motion of your ship is similar to Asteroids and the insect invasion doesn't have much of a visual similarity, but each insect deposits a block that becomes part of a maze and you need to blast the blocks so you don't get boxed in. This is similar to Centipede. The game play differs quite a bit and some of the standard conventions are not used in Cosmic Swarm. CommaVid is a different kind of game company, formed by a group of professionals from computing and the physical sciences. We believe that our experience outside the consumer electronic market will aid us in developing interesting products for our customers. New electronic products are like presents, sometimes it's nice to get what you want and other times a surprise is welcome. By combining our own ideas, and reactions of our customers, we hope to create some pleasantly surprising new products. The immense WAYPOINT interstellar trade depot floats with its small crew at a distant cross roads between the stars. It should be a quiet place to command. But beware -- a dormant colony of giant, alien, mineral-eating termites hidden in one holding section seven have awakened! The Termites invade the main power-conversion chamber and begin assembling a haphazard nest. Your crew is working feverishly, opening crates of tiny remote-controlled planetary-probe ships. It's up to you to pilot a fragile probe ship into the power chamber and clear out the invaders before they jam it totally. By docking with your refueling ship when necessary, and by energizing the nest blocks so your probe ship's fire can destroy them, you may be able to prevail against the invaders and save WAYPOINT. Simple things like moving and firing don't follow standard conventions which initially makes playing difficult. The ship looks like the craft in Asteroids and has the same 8-way directional control with the ship rotating to position. CommaVid decided to separate control for motion and direction. 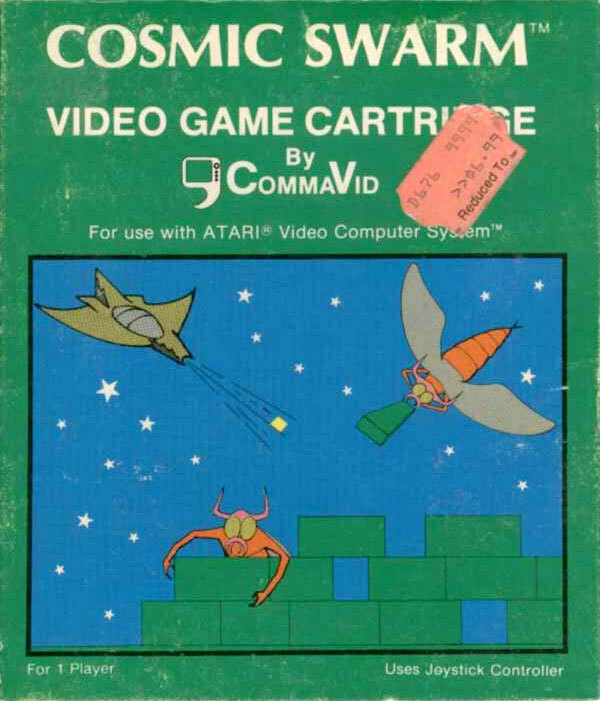 CommaVid was a game developer in the early 1980s who didn't make a lot of games - very few in fact - but those they made are extremely rare. Some of their Atari 2600 titles weren't even games! The joystick moves the ship in the direction you move the joystick, but the front of the ship won't change. So, you might find yourself moving horizontally to the right, but firing to the left. Pressing the fire button enables the ship to rotate and aim it's weapon. Releasing the fire buttons sends a bolt. This is nearly opposite from how most games used the 2600's control. Cosmic Swarm is a single player game that begins with 3 lives and a several things to keep track of. Not satisfied to integrate elements of Asteroids, and Centipede, you have to periodically dock with a re-fueling ship. The insects (Termites) enter the screen and deposit blocks. Touching them kills you. You can shoot the Termite and the block he carries which destroys both. When the green blocks turn red they are vulnerable and can be shot - when green, they are indestructible. Here's another example of how CommaVid doesn't follow convention - but in a good way. Cosmic Swarm is a single player game, but both Difficulty switches are used in order to provide 4 levels of difficulty. Beginner: Set both difficulty switches to "b"
Novice: Set left difficulty switch to "a", set right difficulty switch to "b"
Challenger: Set left difficulty switch to "b", set right difficulty switch to "a"
Expert: Set both difficulty switches to "a"
The left difficulty switch controls the speed of one of the termites; the "a" position is the fastest. The right difficulty switch controls the aggressiveness of the termites. In the "a" position they are much more likely to chase your ship after dropping their blocks. seems like it tries to add too many elements into it's game play. Combined with the unintuitive joystick control, many may give up on this game. I'd encourage you to put in some more time and see if you don't enjoy it once it's play becomes rote. This is part of CommaVid's plan to make engaging 2600 games.